The Lexmark Legal Partner features a vivid, color eTask touchscreen interface that includes icons for workflow applications created to help law offices increase productivity. 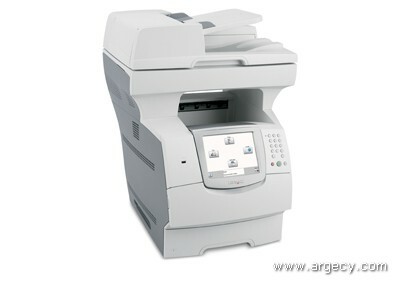 It is built on the award-winning Lexmark X646dte monochrome laser MFP platform, so it also delivers impressive performance with print speeds up to 50 pages per minute and access to print, scan, copy and fax capability from one reliable device. The interface can also be customized to feature the law firm's or channel partner's logo as the operator panel background or a screen saver when it is not in use, which can be especially useful if the device is placed in areas that are visible to clients. The Lexmark Legal Partner features a Scan to Court application that allows administrators to set file limits for scan jobs, since many courts limit the size of electronic files they will accept. If a job exceeds the limit, the Lexmark Legal Partner will automatically separate it into several smaller files so that the document can be sent in segments and meet the court's requirements. The Lexmark Legal Partner also includes a Scan to Network application that allows users to quickly scan documents to custom locations on the network based on their user ID. This allows lawyers to scan documents directly into their personal folders on the network and maintain confidentiality while also saving time. The Lexmark Legal Partner is Copitrak-capable* and allows users of Copitrak software to track copy, fax and e-mail jobs to specific clients, allowing firms to trace each transaction back to an individual billable account. *The Copitrak application must be activated through Control Systems Copitrak and requires additional fees. Instructions on how to activate this application are available through the Copitrack icon on the Lexmark Legal Partner. In order to better understand its customers and deliver products and solutions that will add the most value, Lexmark conducted extensive research to identify unique document workflow management requirements and trends associated with specific industry verticals in the small and medium business (SMB) space. According to those studies, the legal industry places a higher than average importance on file management, with 71 percent of legal respondents stating that file management was "very important." The research also demonstrated that the legal industry places higher than average importance on print, copy and fax tasks. Lexmark research also found that cost recovery and print tracking solutions are the top applications required by legal firms. According to the research, it is important for firms to have a solution to capture, allocate and charge print, copy and communications expenses back to clients. They prefer solutions that are automated and can be integrated through client billing software such as Copitrak, which helps firms manage and recover office-related expenses. Packaged Size (" - H x W x D) 57.6 x 29.9 x 26.5 in. Size (" - H x W x D) 35 x 22 x 26 in. Packaged Weight (lbs) 123.02 lb.